SUMO3 antibody LS-C18914 is an unconjugated rabbit polyclonal antibody to human SUMO3. Validated for ELISA and WB. SUMO3 antibody was raised against recombinant human SUMO3. This purified polyclonal antibody reacts with human SUMO-3 by western blot and ELISA. Although not tested, this antibody is likely functional in immunohistochemistry and immunoprecipitation. This antibody using the specified conditions may recognize other prominent intrinsic bands (UBLs or conjugates). Other intrinsic bands are readily detectable at lower dilutions. Specific conditions for reactivity should be optimized by the end user. Expect a band approximately 11.6 kD in size corresponding to human SUMO-3 by western blotting in the appropriate cell lysate or extract. Store vial at 4°C prior to restoration. Restore with 0.1 ml of deionized water (or equivalent). For extended storage aliquot contents and freeze at -20°C or below. Avoid freeze-thaw cycles. 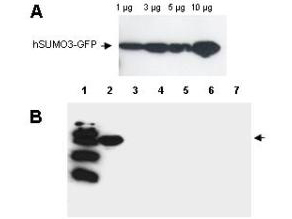 Anti-Human SUMO-3 Antibody - Western Blot. Western blot analysis is shown using Affinity Purified anti-Human SUMO-3 antibody to detect GFP-SUMO fusion proteins (arrowheads). Panel A. Increasing concentrations of human GFP-SUMO-3 were run on a SDS-PAGE, transferred onto nitrocellulose, and blocked for 1 hour with 5% non-fat dry milk in TTBS, and probed overnight at 4°C with a 1:1000 dilution of anti-hSUMO-3 antibody in 5% non-fat dry milk in TTBS. Detection occurred using a 1:1000 dilution of HRP-labeled Donkey anti-Rabbit IgG for 1 hour at room temperature. A chemiluminescence system was used for signal detection (Roche). Panel B. Specificity of the antibody was confirmed by SDS-PAGE of 5 ug of various GFP-SUMO constructs followed by transfer onto nitrocellulose. Lanes: 1. MW marker, 2. GFP-human SUMO-3, 3. GFP-human SUMO-1, 4. GFP-yeast SUMO, 5. GFP-Arabidopsis thaliana, SUMO-1, 6. GFP- Arabidopsis thaliana SUMO-2, 7. GFP-tomato SUMO. After blocking for 1 hour with 5% non-fat dry milk in TTBS, the blot was probed overnight at 4°C with anti-hSUMO-3 antibody diluted and detected as above. Only the human GFP-SUMO-3 band was visualized by chemiluminescence, and no cross-reactivity with other SUMO family members was observed.